Ted Dekker is a Christian novelist who writes Christian thrillers. He has also written several book series of historical nature, several fantasy books, and Christian fiction. Dekker’s interests and range are diverse. He has won the Christy Award for best fiction book, ECPA Gold Medallion Award, INSPY Award, among other awards and recognition. This month, Dekker has published a book which diverges from his usual genre of fiction. His new book is a study/devotional. It’s called The Forgotten Way of Yeshua for Power and Peace in This Life. I’ve been asked to look into the book and give an opinion as to its doctrinal solidity. This article will serve a two-fold purpose. The first part will be to explain and teach how I approach the decision-making process on whether to read a Christian book or engage in a published study. Time is short in our lives and we do not have it to waste on absorbing poor or unhelpful material. Secondly and more importantly, the name of Jesus is tantamount. The material must reflect Him, His word, and His precepts correctly so His name is glorified. Thirdly, as women, we are more prone to error and tend to be unduly influenced by unbiblical things so we must be sure that what we take into our brain doesn’t pollute our brain. (1 Timothy 2:14, 2 Timothy 3:6). Be discerning, wise, and careful. The second part of this article, as you scroll further down, will be a book review by a man who is familiar with Dekker’s works and who has read The Forgotten Way. So, a lesson, and a review. I looked at Dekker’s website, and I read the sample lessons in his study and I downloaded the free sample devotionals. I read 30 pages of the devotional. 1. What I do first is, I look for contemporary buzzwords that indicate where a person’s heart or mind lay. If they use standard, biblical words to describe the standard biblical concepts such as justification, sin, repentance, etc, then all well and good. The first red flag I noticed is calling Jesus “Yeshua”. I’ve observed that many mystics seem to think this gives them more piety when they use the Hebrew name. Also people in the Hebrew roots movement call Jesus ‘Yeshua’. It’s an affectation. More buzzwords below. 3. Any promotional material that says it will change your life is of concern. The Holy Spirit changes your life, not a method. The point is to get to know Jesus better, not to change our temporal lives. Any time we are with Him in the word or worship or hymns or prayers, we become transformed and our transformation through ongoing sanctification changes our life. But short cuts like a 21 day devotional with a newly rediscovered method such as Dekker’s? I’m always suspicious of claims that promise an immediate jump in sanctification. In considering whether to take up a study or read a Christian book, I ask myself if the writer seems to have a grounded, balanced view of Jesus. It seems that in this new study, Dekker’s entire emphasis is solely on the love of Jesus and not His wrath, justice, holiness etc. In fact, it seems he focuses on what WE can get out of Jesus rather than focusing on His attributes for His own glory’s sake. The constant references to “who we are” and being “able to love ourselves”(I got those from his promo video) are concerning. There are sweeping claims in the promo material and in the part of the study I’d read. 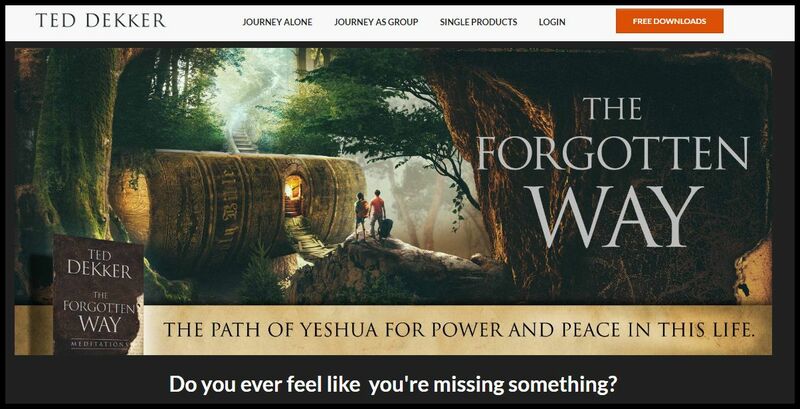 I read such outlandish things as “The whole world longs for the Way of Yeshua” and “An awakening is sweeping the world.” I do not like it when authors make sweeping statements about God as if they know things. Dekker does not know that all 8 billion people of the world long for the way of Yeshua. As a matter or fact, the world rejected and still rejects Jesus and He said they always will. (John 15:18). No one seeks after God. They all go their own way, (Isaiah 53:6), which is not the way of “Yeshua”. So Dekker’s sweeping statements are a problem. Last, I look at who has supported the book or Bible study, or who promotes it. Dekker has blurb support and recommendations from Elevation Church, which is bad. Other readers liken Dekker’s book to Henri Nouwen, who in fact is a Catholic mystic. From these flags, I’d say that the book seems to be a misstep for Dekker. It’s sad, because in his video he said he’d been working on it for years. As a woman, I would choose not to read the book/take the study because these red flags are enough to show me there are problems. I don’t want to use the bulk of my brain power while in a study busily warding off potential doctrinal issues. I want to be able to fairly safely engage in the study so as to learn from it and enjoy biblical truths. With so many better studies out there, I’d say give this one a pass. Here is a review from a friend, Bryn Jones, who has read Ted Dekker’s The Forgotten Way. I did read his e-book Waking Up, which is essentially a promo for the 21 Day “cleanse,” as he puts it. I wrote a review (2 stars). He gets a couple things very right. For instance, he stresses that we need to find our identity in Christ, not in our own efforts to measure up or prove ourselves. But there’s some wrong in there, too. Like you pointed out, he loves the “love” of God, and he comments on the omnipotence of God, but then fails when defining love. To him, love means never being offended and just showing kindness to everyone, never pointing out wrong, just accepting… etc. So, Dekker has some good in regard to the identification with Christ, that our position is secured and not in need of our efforts … but then he ignores the actual “elephant in the room” that many who “got saved” but are living lives that are so sinful they’ve “forgotten who they are” might actually not be saved. So, his advice that they need to just “awaken” to the “reality” of their position in Christ sounds rather … universalist. The other thing that got me about the book was how the author claimed that the Ted Dekker he sees in the mirror, the novelist, is not the real person. It’s like a role he’d play on TV … it’s passing away … the true Ted is this spiritual one in Christ. He assures the readers that he’s not a Gnostic, but it sure sounds like it. I don’t think the “putting off of the flesh” meant that our personalities and occupations and interests are all worldly. God made us who we are and we will be perfected. Maybe I’m being picky. But it sure read very mystic/gnostic to me. I hope this helps. As always, search out these things for yourself, and remember that prayer is the best vanguard. Pray to the Holy Spirit to give wisdom and discernment. (James 1:5). Read your Bible to grow, and be careful of what you choose to study, even from formerly solid teachers. Thanks, this was helpful. I’m not surprised as I’ve always been leery of Decker. Thank you for providing such practical guidelines for evaluating books on the evangelical market, Elizabeth. Discernment isn’t some mystical radar; it’s understanding and applying Scriptural principles properly. This essay reminded me of that fact. I’d never heard of Dekker. After reading this article, I’ve concluded it’s probably just as well. DebbieLynne, I’d read some of Dekker’s earlier books, but the thrillers have dark themes, which turned me off to his entire body of work. This may not be fair, since he also wrote regular fiction and historical fiction, which may not be dark. He has written many books over many years. I prefer Charles Martin, and I’ve heard good things about Randy Alcorn’s trilogy Dominion, Deception, Deadline. who are created in His image and likeness. The issue with Dekker is that he repeatedly steps up to the line between truth and blasphemy then rapidly changes the topic leaving the reader to jump to implicit conclusions.